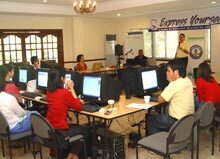 Problogger Abraham “Abe” Olandres and FNF Web Developer Narwin Espiritu familiarized the group with the basics of blogging. At the end of the day, the Newsbreak team added several new posts to their blog: Off Duty. Off Duty takes its readers behind the scenes of a media operation and into the daily lives of journalists. Newsbreak magazine is an independent media organization that aims to deepen democracy and strengthen institutions by holding public officials accountable through its investigative reporting.